Accurately estimating the spatio-temporal distribution of energy, mass and momentum at the surface–atmosphere interface can help develop a better understanding of the complex interactions of the Earth system. 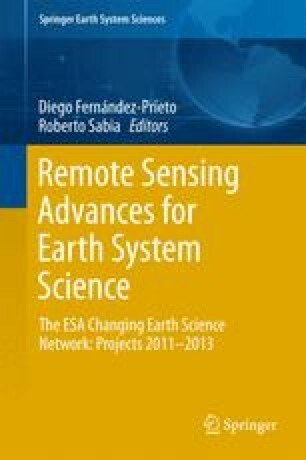 By linking deterministic land surface process model, such as SimSphere, to the spatialised information provided by Earth observation (EO) data, a more powerful synergistic avenue can be developed to take advantage of the temporal and spatial benefits of both modelling and EO-based approaches. The “triangle” utilises the distribution of land surface temperature (LST) and vegetation index (VI) formed by a satellite-derived scatterplot, linked with SimSphere under a full range of vegetation cover and soil moisture, to derive spatial estimates of energy fluxes and soil moisture content (SMC). To this end, the objective of this study was to implement the “triangle” technique using Advanced Along-Track Scanning Radiometer (AATSR) satellite data products to derive and subsequently validate spatially explicit maps of land surface heat fluxes and SM for different ecosystems in Europe. The “triangle”-derived estimations of soil moisture exhibited a minor overestimation of the in-situ observations, and an average error of 0.097 vol vol−1. In overall, results were comparable to those of previous validation studies of the “triangle” implementation. Results for the LE and H fluxes were within the accuracy range of 50 Wm−2, with root mean square difference (RMSD) of 41.15 Wm−2 and 44.37 Wm−2, respectively. Furthermore, there was a good agreement between the “triangle”-derived and in-situ observed instantaneous LE and H fluxes, exhibited by high R values (0.88 and 0.69, respectively). Our study is one of the few studies validating the “triangle” over different ecosystems in Europe. It is a significant step forward in supporting the operational development of this method using remote sensing data in deriving key land surface parameters on a global scale. This work was produced in the framework of the PROgRESSIon (Prototyping the Retrievals of Energy Fluxes and Soil Moisture Content) project, funded by the European Space Agency (ESA) Support to Science Element (STSE) under contract STSE-TEBM-EOPG-TN-08-0005. Dr. Petropoulos gratefully acknowledges the financial support provided by the Agency. Dr. Petropoulos also gratefully acknowledges the financial support provided by the European Commission under the Marie Curie Career Re-Integration Grant “TRANSFORM-EO” project which also supported a part of the participation of G. Ireland in the completion of this work.